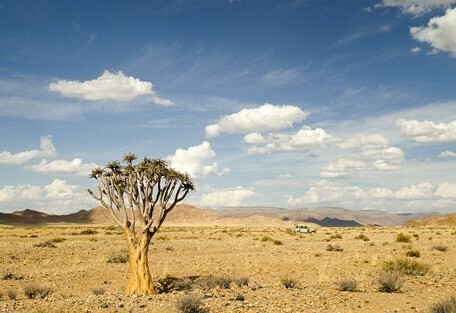 Namibia is the land of dramatic landscapes, open spaces, wild coastline, deserted buildings and ghost towns. This 22-night comfortable self-drive family adventure offers you the opportunity to really get to know Namibia, both from a tourist and local point of view, as you drive in a full circle around Namibia. Enjoy a hot air balloon over the famous red sand dunes in Sossusvlei, enjoy cultural tours in villages, get the adrenaline pumping in Swakopmund, search for the Desert Elephants in Damaraland, marvel at the rock paintings in Twyfelfontein and spot the Big Five in the Etosha National Park. 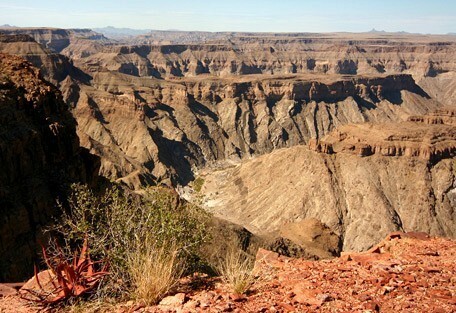 If that's not enough, you'll also get to see the Fish River Canyon - the second largest canyon in the world! Those are just a few examples of what is on offer in Namibia. Drive back to Windhoek, drop off the rental car and head home. Arrive at Windhoek International Airport. Collect your rental car and drive to the Kalahari. Spend 2 nights at Teufelskrallen in tents on a bed and breakfast basis. 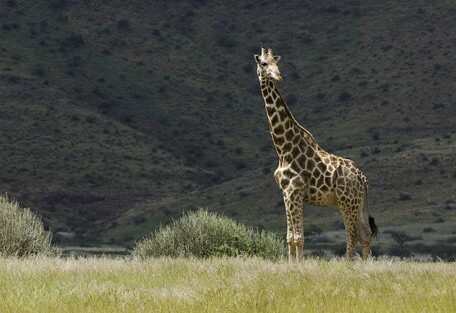 Teufelskrallen is fascinating cattle and game ranch situated on the first Kalahari Dune. Guests can enjoy unspoilt views of typical desert landscape and endless plains. All tents are comfortable and fully furnished. 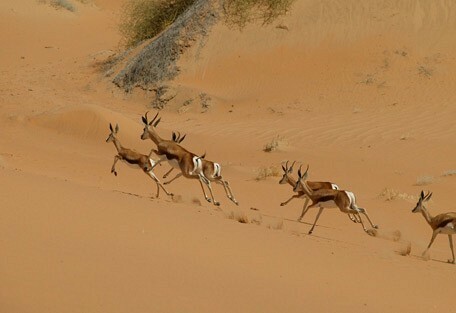 Guests can enjoy nature walks and game drives with the red sand dunes of the Kalahari forming a backdrop. Continue your visit to the Kalahari, driving to Mata Mata. 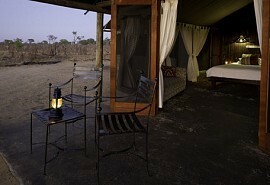 Spend 3 nights at Torgos Safari Camp in tents on a dinner, bed and breakfast basis. Torgos Safari Camp is a farm located on the border of the Kgalagadi Transfrontier Park and offers guest accommodation in luxury safari tents. There is a communal lapa area boasting a bar, dining area and lounge. 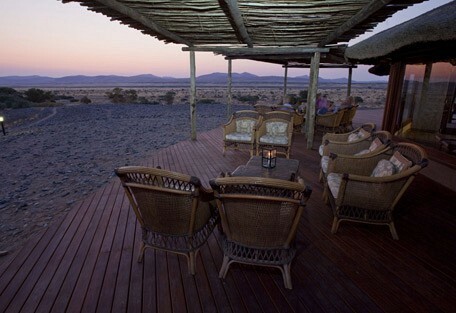 Evening game drives normally end with sundowners on one of the highest dunes overlooking the Kalahari. Travel south driving to the Fish River Canyon. 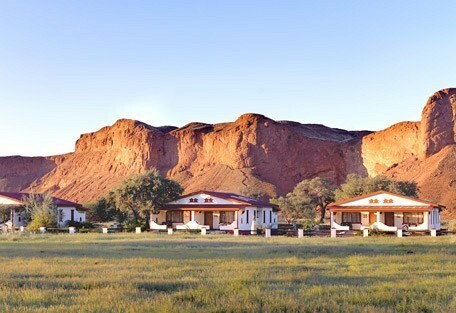 Spend 2 nights at Canyon Lodge on a bed and breakfast basis. The Canyon Lodge is situated a mere 20 km from the main viewpoint of the Fish River Canyon. Built around an old farmhouse, it is a rustic, yet stylish lodge. Rooms are wedged and fit in among large granite rock outcrops. 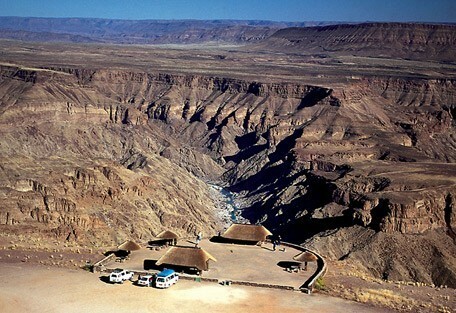 A great place from which to explore the Fish River Canyon which is the second largest canyon in the world. Drive to Aus, best known for the wild desert horses. Spend 2 nights at Klein Aus Vista Desert Horse Inn on a bed and breakfast basis. The Klein Aus Vista Desert Horse Inn is located in the Aus mountains and offers panoramic views of mountain scenery and desert plains. Enjoy sundowners on the wooden deck and if you're lucky you'll see the wild desert horses. Head back towards the Namib Desert, stopping en route in the farming region of Helmeringhausen, close to Sossusvlei. Overnight at Namib Desert Lodge on a bed and breakfast basis. 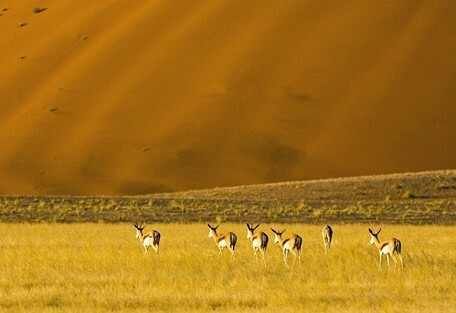 Sossusvlei is known for its tall, majestic red sand dunes. 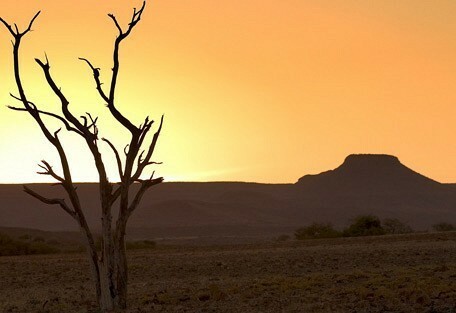 Tourist brochures always depict Namibia with brazen orange sunsets setting behind sand dunes. This is Sossusvlei! The Namib Desert Lodge is located on the foot of a fossilised dune. Guests can cool off in their choice of either a saltwater or freshwater swimming pool. Drive to Sossusvlei. 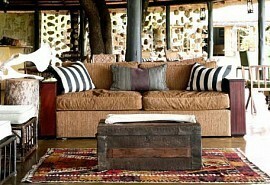 Spend 2 nights at Kulala Desert Lodge in a family room on a dinner, bed and breakfast basis. The Kulala Desert Lodge is located in a private concession and is the only lodge at the foot of the red sand dunes. Guests can enjoy hot air balloon rides of the Namib Desert. Each room has a private roof terrace for sleeping under the stars. Head to the coastal town of Swakopmund. Spend 2 nights in Swakopmund. Beach Lodge Swakopmund offers a unique location, situated directly on the beach it provides the ideal hide-away for honeymooners or guests wanting a quiet holiday; although a beach destination early mornings and evenings can be cold throughout the year. Make your way to the Khorixas region, exploring the Damaraland. Spend 2 nights at Damara Mopane Lodge in a triple room on a bed and breakfast basis. The Damara Mopane Lodge is built under Mopane trees and is reminiscent of an African village. The lodge is set in beautiful gardens and is ideally located close to the rock paintings at Twyfelfontein. Drive to the village of Opuwo, best known for the Himba people. Spend 2 nights at Opuwo Country Hotel on a bed and breakfast basis. Situated on a hilltop overlooking hills and valleys, the Opuwo Country Hotel is the ideal base from which to explore the cultures and traditions of the Ovahimba. Enjoy a guided cultural tour to the Himba village. A great place to learn about the local inhabitants of the Namib region. Start travelling towards Etosha via the Kamanjab region. Overnight Kavita Lion Lodge in a family cottage on a bed and breakfast basis. The Kavita Lion Lodge specialises in lion conservation and guests can watch the lions from the safety of their hide. Accommodation is in spacious, well-appointed en-suite bedrooms and thatched chalets. The last leg of the trip takes you to the final section of Etosha, the Andersson gate. Spend 3 nights at Etosha Safari Lodge on a bed and breakfast basis. 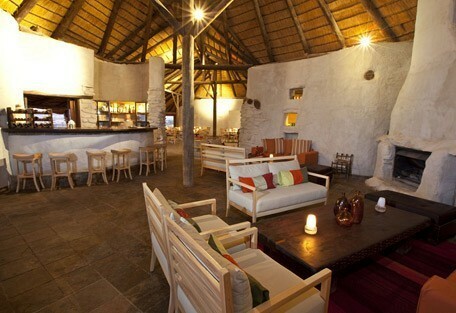 Etosha Safari Lodge has 55 chalets ideally located on a hill overlooking tree-covered hills. There is a restaurant, bar and 3 swimming pools. Make your way to the Waterberg area. Overnight Frans Indongo Lodge in a family unit on a bed and breakfast basis. The Frans Indongo Lodge is a traditional Namibian style lodge with modern finishings. 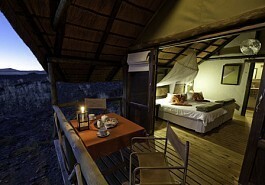 Guests can watch the sunset from the observation tower and watch the Big Five flock to the resident waterhole.